The day once again dawned bright and sunny, though a bit cooler. After a full day and a good night's sleep, my stomach finally felt up to real food, so I ate as much as I could at breakfast to backfill the lost calories. I had a fairly tight schedule to keep, since I was planning on visiting the distillery on the neighboring Isle of Jura in the morning as well as the nearby Bunnahabhain distillery later in the afternoon. The trick was the ferry between the two, which proved to be something of a stumbling block. It was a short ride from the Ballygrant Inn to the ferry at Port Askaig. The last quarter to half a mile approaching the water is very steep and a little bit nerve-wracking on a bike, but I made it down without slipping, though my forearms were a bit sore from gripping the brake levers all the way down. I got to the ferry just in time and slipped in beside the cars. Less than a mile of water separates the two islands, but the ferry is the only way for vehicles to get on and off the island. It was a fairly quick trip across, all of maybe five minutes, then up the ramp to Feolin where I started down the road towards Craighouse. There were about ten miles to cover. While it wasn't particularly hard going, there were a few long hills that took some work to climb. It helped that the terrain was absolutely gorgeous - it's a shame that I was in a hurry because I missed getting any pictures along the way. One indication that my stomach still wasn't quite in tip-top condition was how off the malty smells coming from the distillery hit me as I rolled into town - something about it just rubbed me the wrong way. The upside was that I had managed to arrive early, so I locked up my bike and sat on a bench alongside the harbor soaking up the sun. While breakfast had been helpful, I was running such a deficit from the day before that I was already pretty tired again. A rest definitely helped, so I eventually wandered over to the distillery for my tour. Jura is one of the few distilleries whose products I had not sampled before setting off for my trip, so I didn't know what to expect from the place. The current iteration of the Jura distillery was rebuilt in the 1960s in an effort to bring money and jobs to the island, which is home to fewer than 200 people. While the distillery is the single biggest employer on the island, it is owned by Whyte & MacKay, which means that most of the profits end up in other hands. The distillery buys all of its malt, both unpeated and peated, from commerical maltsters on the mainland. The peated malt is at 40 PPM phenol content, placing it above distilleries like Caol Ila or Lagavulin, but below Ardbeg and Laphroaig. 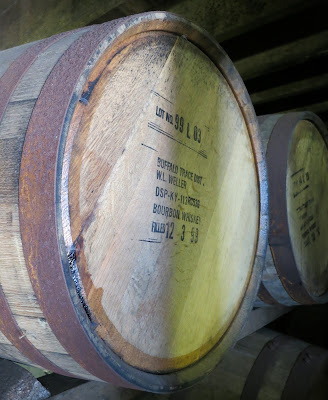 Peated whisky is only produced for four weeks out of the year, with the rest of their schedule devoted to unpeated malt. Jura uses a single mash tun, which is actually fairly small - it takes two mashes to fill a single one of their enormous washbacks. 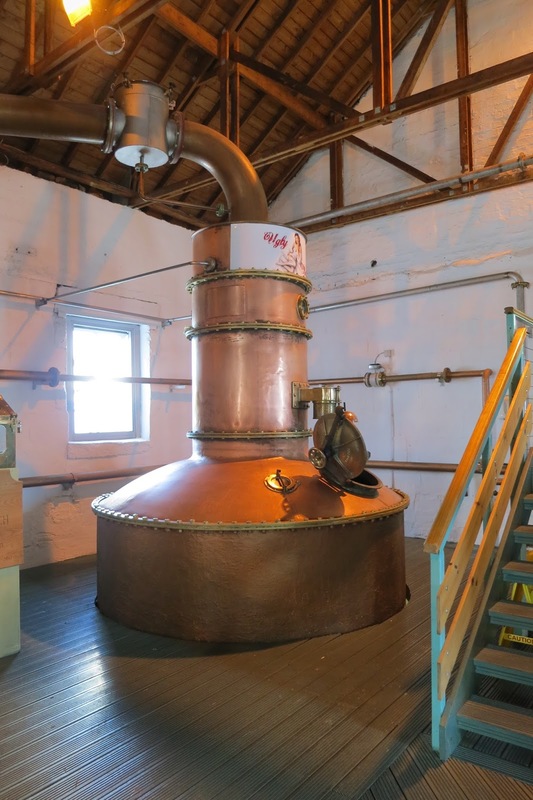 As many distilleries are moving to, all of the mashing and fermentation is carried out in stainless steel, which probably helps to improve consistency, though perhaps at the cost of complexity. The fact that it takes two mashes to fill a single 48,000 liter washback produces a unique procedure for fermentation: a strain of short-acting yeast is added with the first half of the wash, then a long-acting yeast is added with the second half of the wash. In total, fermentation takes a relatively short 54 hours to produce wash at 9% alcohol, which is higher than the other distilleries I visited. The wash smelled very fruity and estery - compounds that are likely captured during the next step. Jura has, as far as I can gather, the second tallest stills in Scotland, after Glenmorangie's. 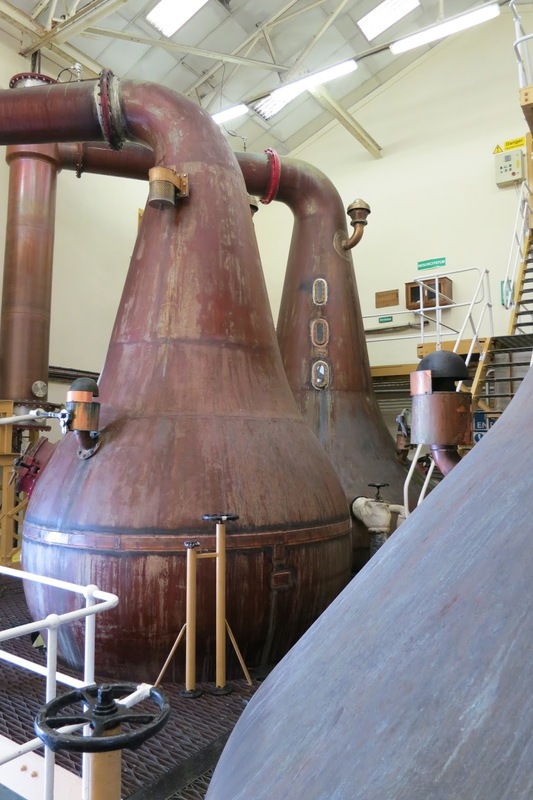 However, unlike the thin, delicate stills at Tain, Jura's are hulking beasts. These were easily some of the biggest stills I saw on my trip - the wash stills have a capacity of 25K liters (only Bunnahabhain and Caol Ila's are bigger) and the spirit stills are 22K liters (only Caol Ila's spirit stills are bigger) they are clearly built to crank out vast quantities of spirit. Which Jura certainly does, putting out 2.2 million liters a year. 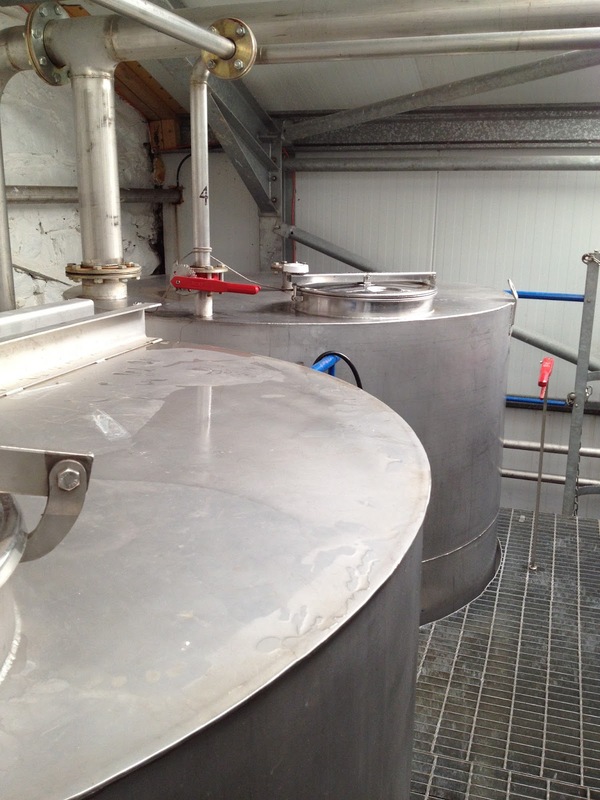 The contents of each washback will then be split evenly between the two wash stills, filling them almost to capacity. This will tend to reduce copper contact, pushing heavier compounds into the condenser. Balancing this, the lamp glass shape along with their extreme height should also increase reflux. Additionally, Jura tends to run their stills fairly slowly, with the wash stills taking eight hours to complete a stripping run and the spirit stills going for eleven hours before the last of the tails come off. On balance the end result of a relatively light spirit, emphasizing esters and other lower boiling compounds. After leaving the stillhouse, we went over to the filling station, which casks are filled with new make spirit. Jura, like almost all distilleries, primarily uses ex-bourbon casks, with a smaller number of ex-sherry, French oak, and ex-wine casks. 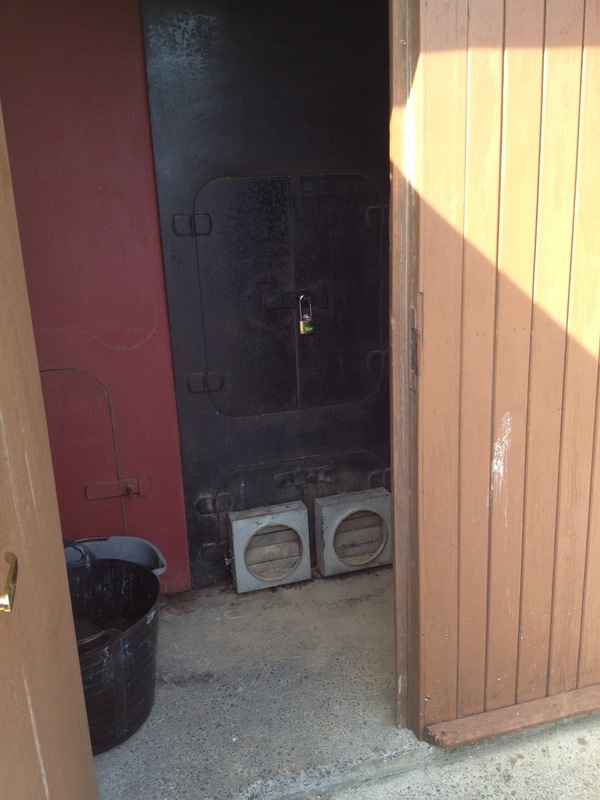 There is also an on-site cooperage for repairing damaged casks. At this point the tour wrapped up and we went back to the visitor center. There were complimentary drams of our choosing - I tried a bit of Jura 10 Year, but my stomach wasn't on board at that point. I will give the distillery major points for one thing - it was the only one I visited that didn't charge a thing for their tour. I finally wandered back into the sunshine. At this point I had to make a decision - it was around lunchtime and I had to be at Bunnahabhain around 2 PM. That meant that I had to catch one of two ferries. The question was whether to make a dash for the next ferry, which would be close, but would get me back to Islay early with enough time to grab lunch in Port Askaig, or stay in Craighouse for lunch and try to catch the one after. Though breakfast was a fading memory, I decided that I had enough juice to make it back to Feolin and cared more about ensuring that I got back to Islay with time to spare. There was a brief freakout when I realized that I had lost my bike helmet. After searching around, I finally managed to find it on the bench where I had sat in the sun only a few hours before. I don't think I'll ever get used to how low the chances are of something being stolen in the more remote bits of Scotland. Reequipped, I headed back towards the ferry terminal. The ride was something of a mad dash, as I was cutting it a bit close. When I reached the southern bit of the island, I could actually see the ferry starting to come in, which made it a race to get there before it departed. I cranked hard, burning my last reserves in an effort to make it on time. Wonder of wonders, I actually got there right as the last car rolled off. However, my joy was short lived. An oil tanker truck was being loaded onto the ferry, which meant that no other passengers could be taken. So I had to wait. Normally, when this happens, the ferry is supposed to swing back and pick up the passengers who have been left on Jura. However, because there were only a handful of people waiting, the ferry lingered in Port Askaig for an entire hour. This left me stuck staring across the short expanse of water, bitterly cursing my decision to ride hard instead of staying in Craighouse for lunch. I wasn't completely dead, as I had a granola bar in my pannier, but it was thin fare under the circumstances. The ferry finally made its way back across the water and I was finally able to get on. It was a quick trip to Port Askaig, but I had lost a critical hour. So I had a new decision to make - stay in Port Askaig so I could eat or push on to Bunnahabhain for my scheduled tour? Being the stubborn sort and because the Manager's Tours are only offered once a week, I ended up going with the latter. The climb out of Port Askaig was a bit rough on an almost empty stomach, as was the rolling route to Bunnahabhain. Thankfully it was only a few miles, so it didn't take too long to find myself on the pretty little bay where the distillery is situated. I managed to arrive just in time for Andrew Brown, the distillery manager, to gather everyone around for the tour. Mr. Brown has been working at Bunnahabhain since 1988 and slowly risen through the ranks, working in just about all areas of the distillery during the course of his career, becoming manager in 2011. This was good for me as he has a detailed knowledge of the inner workings at Bunnahabhain and how they have changed over time. Just about everything about Bunnahabhain is big. The distillery was built in 1881 during the late-19th century whisky boom (which also saw the creation of Bruichladdich on the other side of the island) to provide whisky for blends. The site was selected for three things: water, peat, and ease of access. Bunnahabhain gets its water piped in from a spring in the hills above the bay, which means that, unlike most other distilleries on Islay, its water is not particularly peaty. However, from its creation in 1881 until 1963, it produced all peated whisky, in keeping with its focus on providing malt whisky for blends. At that point there was a radical change - peat was out, unpeated whisky was in. 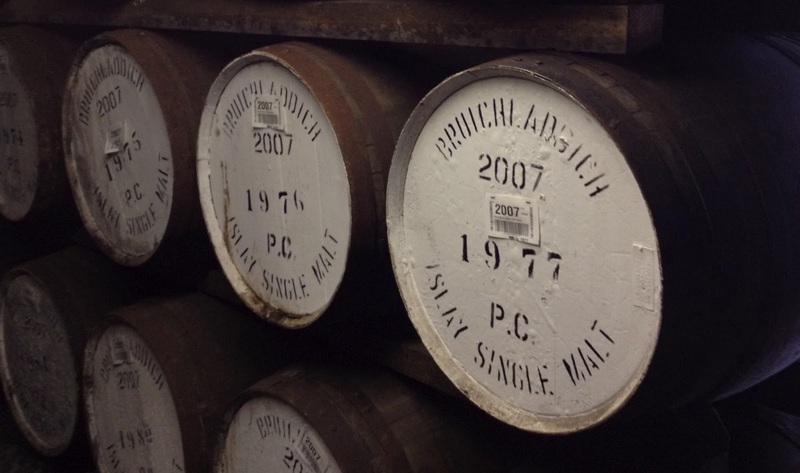 With one exception, Bunnahabhain produced exclusively unpeated whisky for 40 years. Last, but not least, Bunnahabhain's location was picked for ease of access. It is located on a very pretty bay just north of Caol Ila (which was built a few decades before), which meant that it was very easy to bring in malt and caol, then take out malt whisky. Andrew explained to us how malt used to be delivered by puffers - small ships that plied the Hebrides. 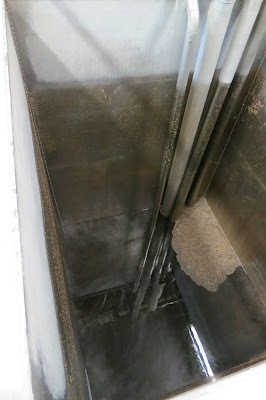 Malt, 500 tons per boat, would essentially be hoovered out of the holds and into the distillery's malt barns. The puffer fleet folded in 1993 when subsidies were removed and they were unable to compete with the roll-on ferries that were by then servicing the islands. This has had the effect of turning one of Bunnahabhain's original assets into something of a liability, as large trucks now have to navigate the narrow, steep, and twisty roads down to the distillery - much to the locals' chagrin as it has the effect of wearing down the roads very quickly. Bunnahabhain is first and foremost a distillery for blends - this means that everything is done on a huge scale and with an eye towards efficiency. 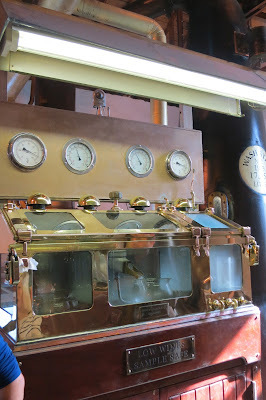 They crank out 2.1 million liters per year, which isn't even running the distillery at its full capacity. The distillery consumes 300,000 liters of water a day, both that which goes into the whisky and for cooling the wort and condensers. There is space for 900 tons of malt in their barns, which is necessary because deliveries can be delayed by weather and the distillery consumes an average of 160 tons per week. 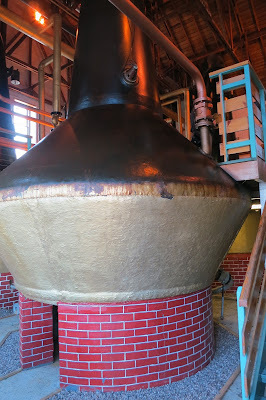 The distillery now produces both peated and unpeated spirit, with a roughly 20:80 split. The experimental run of 38 PPM peated spirit in 1997, the first since the distillery switched over to unpeated malt in 1963, was revisited after the distillery was purchased by Burn Stewart in 2003 and use of peated malt has expanded since then. As a side note, I was told that, contrary to what I have read elsewhere, there was no peated malt produced in 1992. So any independent bottlings of Bunnahabhain from 1992 with a distinctive peat flavor was not something that came from the distillery itself - some of their spirit may have been racked into casks that previously held peated whisky. The distillery's malt is ground differently than others I saw, with a higher proportion of husk and less grist and flour. Husks help to strain the mash, filtering out the residual grist and flour, which should help to produce a cleaner wort after mashing. They use 12.5 tons of barley per mash, running four waters of increasing temperature over the course of 12 hours, recycling the third and fourth waters to become the next first and second - one way in which the distillery seeks to increase efficiency. There are ten mashes run per week, stopping every fifth to clean out the tun. 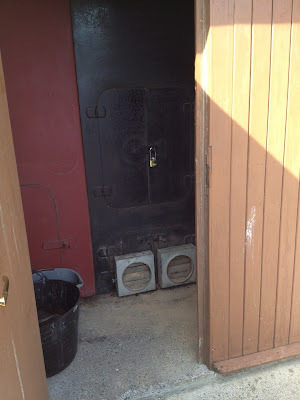 Bunnahabhain, like Bruichladdich and Springbank, used to have a cast iron mash tun. However, it cracked some years ago and had to be replaced with a stainless steel tun. The copper top, however, is original. Andrew told us a story about the new tun - the bottom plates from the old tun were used in the new tun. However, they didn't fit properly, which left a two inch gap. The distillery staff complained to the head office for years that it was going to cause trouble someday, but they were ignored until one day the rake caught in the gap and ripped it up. So what could have been an easy fix turned into an expensive problem, shutting down production for a significant amount of time. Just goes to show that when you're in a capital and time-dependent business, it doesn't pay to ignore the little things. After leaving the mash tun, the wort is piped to the underback to settle, then on to the wort chiller, where it is cooled to 2º C less than the optimum temperature for fermentation, to allow the liquid to have some capacity to absorb the heat that will be generated by the yeast. 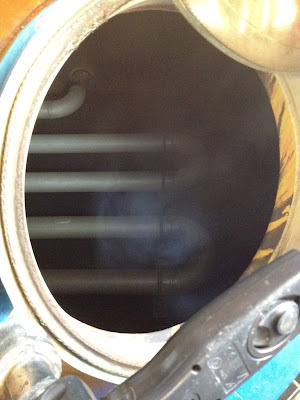 The wort is piped to the distillery's six Oregon pine wash backs. Each has a capacity of 62,500 liters and is filled ~2/3 full. M and MH strain yeast is added to the unpeated wort, which is fermented from anywhere between 48 hours on weekdays to 110 hours over the weekend, producing wash a 7.5-8% ABV. The wash backs are filled and drained on a 12 hour rotation, to allow for time to wash them thoroughly in between every other fill. The wash backs are about 15-20 feet tall, with a false floor most of the way up. Andrew mentioned that this wasn't always the case - years ago one could only move around at ground level. This was hazardous because of the huge quantities of carbon dioxide given off during fermentation and the lack of good ventilation. Carbon dioxide is heavier than air and tends to settle near the ground, which meant that anyone entering the room had to get in and out before they ran out of breath. At least one person died because they spent too long inside. This is also why falling into one of the wash backs was almost a guarantee of death - while it might be possible to tread water in the wash, the carbon dioxide would quickly lead to asphyxiation. Thankfully health and safety standards are much higher now, so the carbon dioxide is mostly vented outside. The wash stills are the tallest on the island and some of the tallest in Scotland, at a towering 25 feet, 10 inches tall. The pear shape is reminiscent of the stills at Lagavulin, but the lyne arms are flat, so the shape is relatively neutral in comparison to some of the wilder stills on the island. The height will give a lot of reflux, but there are no other tricks to increase copper contact. Each wash back has enough liquid in it for four charges of each wash still, which is filled to about half its 35k liter capacity (the largest on Islay). The wash is piped in and allowed 10 to 40 minutes to settled (more time for shorter fermentations, less for longer ones), then heated to 92.5º C for 3.5 hours. The wash stills are currently being run a bit harder to get them in sync with the wash backs - another example of hour much efficiency is prized in the distillery. Everything is run with an eye towards creating the minimum amount of down time. 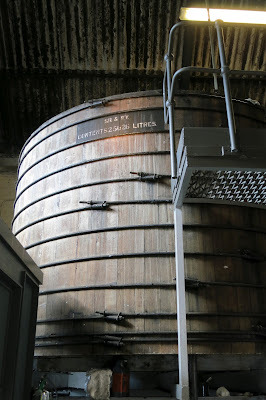 The low wines are then piped over to the spirit stills, which are a fair bit shorter at 20 feet, 10 inches tall. The spirit still is run more slowly, taking five and a half hours to do a single run. They generally do ten runs, then let the still rest for eight hours, which lets the copper reoxidize so that it can more effectively remove sulfur compounds from the spirit. Each still is filled to 60% of its 15,546 liter capacity, which should help to increase copper contact. The foreshots are relatively short, going from between 10-30 minutes, which removes the toxic compounds while keeping some of the lighter fruity and floral esters that Bunnahabhain's unpeated whisky is known for. The stillman knows he has hit the hearts largely by the rate of flow, about 30-50 liters per minute. When the spirit gets down to 62.5% ABV, the flow is switched over to feints and run down. 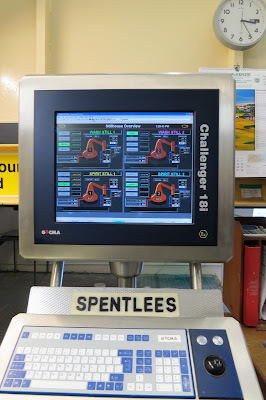 Once again in keeping with their focus on efficiency, the whole distillation process can be controlled from a single computer in the still room. This not only keeps track of what is going on from moment to moment, but also records previous runs so that consistency can be maintained and any deviations from the norm spotted. While there are certainly some advantages to doing things in a traditional, i.e. uncomputerized, fashion, the quality of the spirit coming out of Bunnahabhain these days it top-notch, so I can't say that their single malts suffer. The new make spirit is proofed down to a standard 62.5% for filling into casks. While most of Bunnahabhain's spirit goes into first and second fill ex-bourbon barrels, about 10% go into first and second fill ex-sherry casks, alongside a smaller array of other casks like ex-port pipes. 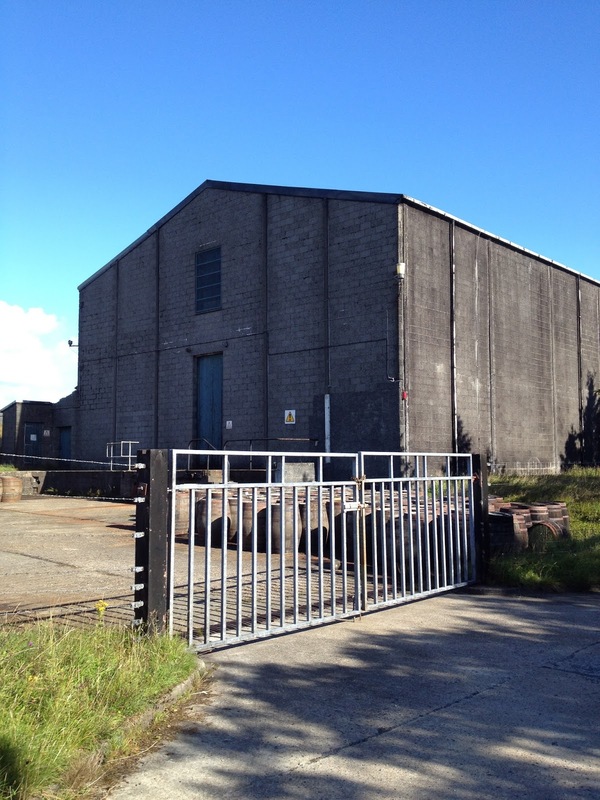 Bunnahabhain has a mix of traditional dunnage and newer rack warehouses on site. While they primarily store their own spirit, there are also a fairly large number of casks from Tobermory, another distillery in the Burn Stewart portfolio that has very little of its own warehouse space. The tour ended with a tasting of a Bunnahabhain's core range of whiskies, from their new NAS bottlings (Darach Ur and Toiteach) to the 12, 18, and 25 Year. Between being hungry and the lingering effects of being sick, I didn't get as much out of it as I would have liked, but it was still enlightening. 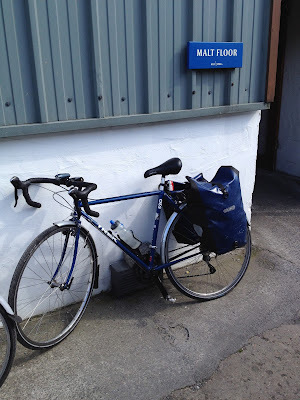 After poking around the distillery for a bit - and getting eaten alive by the midges on the stairs to the visitor's center - I finally got back on my bike for the ride to Ballygrant. Between the steep, narrow roads and the lack of blood sugar, it was somewhat hard going, but the gorgeous landscape helped to balance it out. After getting back to my room, I basically had an early dinner and crashed. It had been a long day, but thankfully the next one would be a lot quieter. BenRiach is a distillery located on the north side of the Speyside region, near Longmorn (see Malt Madness for the full story about BenRiach's connection with Longmorn). For the purposes of this review, the interesting bit of history came after BenRiach was purchased by Seagram's in 1977. In the early 80s, the distillery began to distill runs of heavily peated (50 PPM) malt in the style of Islay whisky. This was done because of the decreasing supply and increasing cost of Islay whisky at the time. As heavily peated whiskies are a key component in many blends and Seagrams did not own any distilleries on Islay, they wanted to bring some of the production in-house to ensure supply. When BenRiach was purchased from Chivas in 2004 by Billy Walker, there was a significant stock of aging peated single malt in the distillery's warehouses. It has since been released in a number of different ages, ranging from 10 to 21 years old. 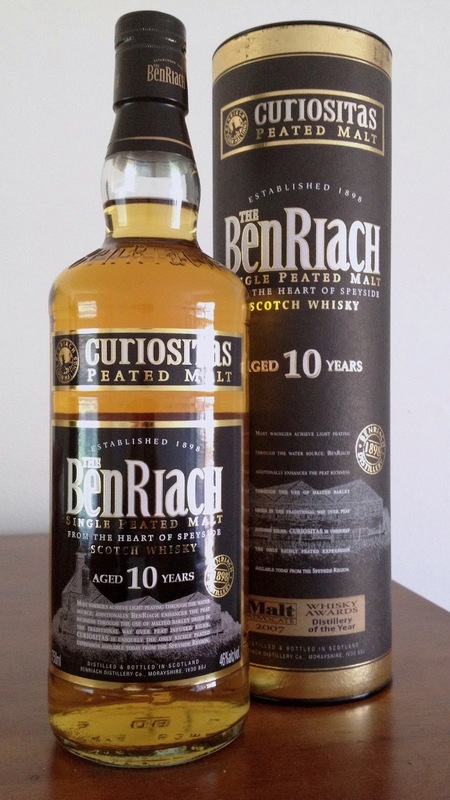 BenRiach has also taken the somewhat peculiar step of naming all of their peated single malts with Latin names. Today we'll be looking at the youngest peated single malt from BenRiach, which is bottled at a solid 46% without chill filtration. Taste: lots of malt and bourbon sweetness up front and in the middle, a combination of peat, oak tannins, pepper, and wood smoke/ash come in quickly along with something a bit medicinal, muddled fruit around the middle, becoming fairly bitter near the back. After dilution, everything layers on top of each other instead of coming in distinct phases, the peat gets a bit more rubbery (especially at the back), and it's a bit flatter and less sweet. This one is a bit of an odd duck. The character of the peat is very different than anything else I've tried - it's much more like fresh vegetation, with a sense of living things rather than the more smokey or decayed vegetation one gets from a lot of Islay whiskies. However I think it can stand up to any of the big Islay peat bruisers - if you like Ardbeg or Laphroaig this should definitely be on your list. At the same time, it reminds me of Ledaig 10 Year, because of the heavy bourbon barrel influence. That helps to give it plenty of sweetness and depth to counteract the huge blasts of peat. Overall, I think this is a good whisky to pick up if you already like peat - it's something different to challenge your palate. However, it's not what I would go for if I was trying to introduce someone to peat or whisky in general. The flavors are just a bit too peculiar. 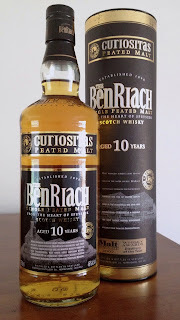 As a last note, this makes me really interested to try the various cask finishes that BenRiach has done with their younger peated whisky. It's a solid base of smoke on which to layer other flavors, but given my skepticism of finishes, I'm going to moderate my expectations. 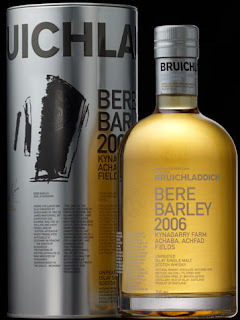 Bruichladdich has become known for making experimental whiskies and this is one of the odder ones. Bere (pronounced like 'bear') is a very old strain of barley that was cultivated by the Vikings as they invaded Scotland in the 9th century. It is well adapted to grow in the colder, acidic soils in northern Scotland and has a very short growing season - roughly 90 days - which made it well-suited to the short summers in northern latitudes. Bere is a six row barley, whereas most modern varieties are two row. Six row barley tends to have a higher protein content compared to two row barley, which has more fermentable sugars, making it the preferred variety for most distillers. Many thanks to Michael Kravitz for a sample of this whisky. Nose: very strong and distinctive barley/grain notes, creamy citrus, green/vegetal new make, savory baking spices, a little vanilla and brown sugar oatmeal, maritime/salty, a hint of cheese. After adding a few drops of water, the malt becomes more prominent and creamier while taking on a slightly different character, while the new make notes retreat a bit. Taste: sweet malt with a lemon accent up front, strong new make quality throughout, pepper/alcohol prickles, very light creamy oak with a hint of baking spices at the back. After dilution, there is more citrus up front, more oak and barrel char at the back, thicker mouthfeel and flavors overall, bittersweet character, and the new make notes become more integrated. I felt like this was an interesting demonstration of how different strains of barley can change the character of whisky, but it's not something I can see myself wanting to drink on the regular. There's obviously a fine line to toe between letting the malt/spirit shine and tempering it with time in the barrel. I feel like Bruichladdich could have used some slightly more active casks or given the spirit a bit more time to mellow before bottling it. I've also tried Arran's Bere Barley whiskey, which agreed with me much more as it felt much more balanced. With all that said, this is my own sense of taste. But I would recommend trying this whisky before buying a bottle, if you've been considering. Best of all, it'd be a great one for a whisky club to split (maybe compare with the Islay Barley or other younger Laddies? ), so everyone can experience it without having to commit to a whole bottle. I've reviewed this whisky once before, but that was from a dram at a bar, so I didn't feel completely confident about my assessment. Subsequently I picked up a 3x200 mL pack that included Glenkinchie 12, Oban 14, and Dalwhinnie 15 - the Classic Malts Gentle Collection. While I've found that too often 'gentle' is another way of saying 'bland' in the whisky world, I wanted to give it a fair chance. Once again, I'll leave the history to Malt Madness, as it's fairly complicated. A few noteworthy things about Dalwhinnie is that the distillery is located at a higher altitude than almost any other in Scotland and that it still uses very old-style worm tub condensers, which contribute to the flavor of the spirit by reducing the amount of copper contact. As with most of Diageo's single malts, this one is reduced to 43% and chill filtered. Nose: sweetly malty and grassy, lots of vanilla and fruity (raspberry) esters, very light sherry, barest hint of peat/vegetation, cotton candy, grape (purple? ), apple cider, dates, graham crackers, cinnamon chocolate, and honey. After adding a few drops of water, it becomes flatter and more vegetal and oaky, the malt and vanilla notes become mustier, the floral notes increase significantly, and it become distinctly purple rather than grape-y. Taste: sweet opening - malt, vanilla, and very mild sherry, moderate pepper and ginger mid-palate, light oak tannins at the back. After dilution, it becomes even sweeter with more malt and vanilla, there's a pleasant sour apple and wine tinge throughout with a hint of cacao and something grassy, the pepper is reduced, but the tannins become sharper and more pronounced. As Serge noted, this is a great malt for bringing people over from the blended whisky side. It's not very aggressive - I don't think gentle is the adjective I would use, but pleasant seems right. There isn't a lot of complexity, but everything present is solid and tasty. I also think it accomplishes a lot of what Diageo is lacking in the Lowlander department - a lighter, grassier spirit that still has enough heft and flavor to be enjoyable. It also improved over time, which is always nice. While I'm not sure it's one that I'm going to buy a whole bottle of at this point in my whisky journey, I would still be quite happy to drink it if someone gave me a bottle as a present. Best of all, it's very reasonably priced, clocking in around $55 most of the time. Given that a lot of 12 year old single malts are now starting at that point, it's quite a bargain for a 15 year old. There are many things to dislike about Diageo, but they have been keeping the prices of a lot of their entry-level malts under control, which is appreciated. What was supposed to be one of the best days of my trip instead turned into one of the worst. I'm not exactly sure what happened, but I think I got some kind of food poisoning. This resulted in a miserable, mostly sleepless night as my GI tract twisted itself in knots. By morning, I felt terrible and could barely get myself to eat anything for breakfast. However, I was just well enough to wander a few hundred meters down the road to the Bruichladdich distillery for the tour I had scheduled. I was just holding it together by the time the tour started. Becky led us off to the building where Bruichladdich's malt is stored and processed. 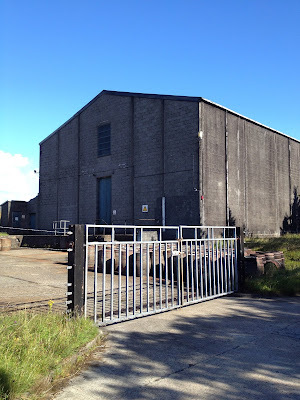 As with most distilleries, Bruichladdich buys most of its malt from a commercial malster, in this case Bairds in Inverness. Smaller quantities of organic malt are purchased from Orkney and even smaller quantities are purchased from local farms for their Islay Barley series. 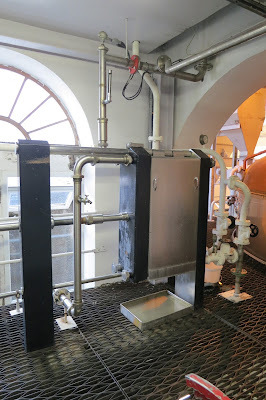 After milling the barley in a fairly standard fashion, Bruichladdich adds the grist to their cast iron mash tun. It is one of the few left in operation and has some wicked looking rakes inside. The mash is then fermented in Oregon pine washbacks for a fairly long 72 hours to give wash at ~7% ABV, a little under the usual strength. They use two different strains of yeast, K and M, which have shorter and longer fermentation times, respectively. Bruichladdich doesn't fill its washbacks very high - only 36K liters of the 45K liter capacity is used, which means that they don't need switchers since there is little threat of them bubbling over during fermentation. Somewhat like Bowmore, the washback room smelled kind of like maple syrup. 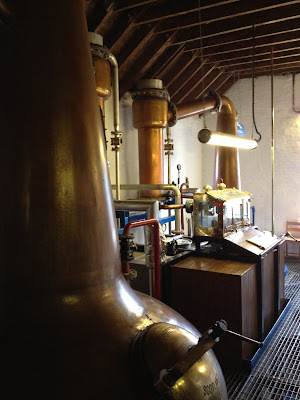 Bruichladdich has two pairs of stills. Each washback contains enough liquid for three wash still charges, filling each still to 69% of its capacity. The wash stills are fairly plain, with slightly descending lyne arms, which should give a moderately neutral profile, though their height will increase the lightness of the spirit a bit. The low wines are then transferred to the spirit stills, which are roughly the same height but have much more narrow necks, which should increase reflux significantly. One peculiar feature of the still room was the gin still off in the corner. 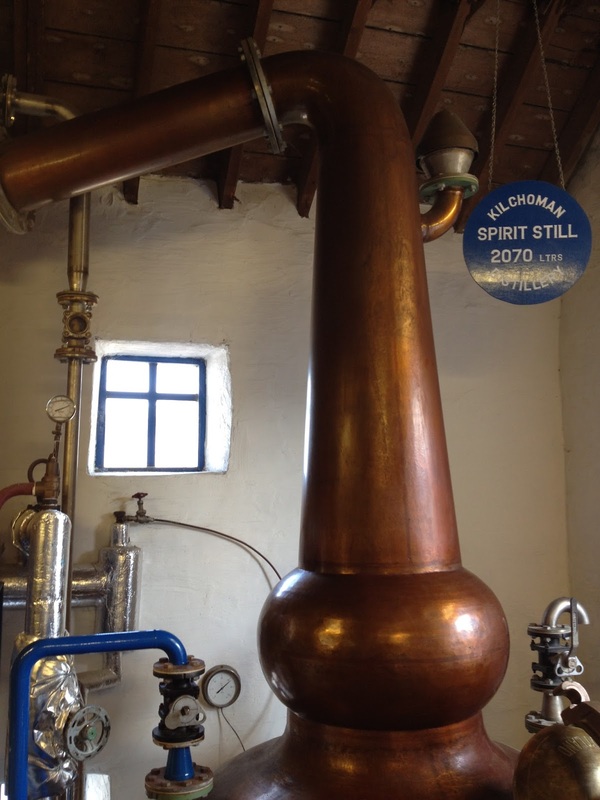 Named "Ugly Betty", it's an old Lomond still that has been repurposed for making Bruichladdich's Botanist gin. However, it's only been fired up four times since it was installed - each run produces enough spirit for a quarter of a million bottles of gin. From the still room we went into one of the bonded warehouses. The ground floor was dunnage, with more storage up on a second floor. It was fascinating to see the variety of casks Bruichladdich keeps on site. Sadly I had to pass up a sample of Octomore aged in ex-sauternes casks that was handed down from the floor above - my stomach just wasn't up to it at that point. This was a shame, since I had been hankering to try Bruichladdich's Octomore Comus release, which was the same idea - heavily peated whisky aged in ex-sauternes casks. We passed briefly back outside before heading over to the bottling hall. 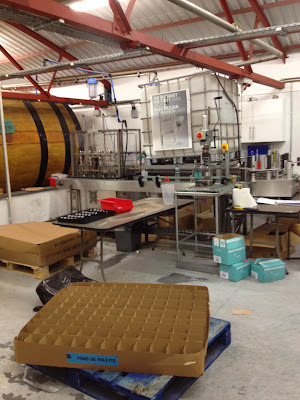 Bruichladdich is one of two distilleries on Islay that does its own bottling. 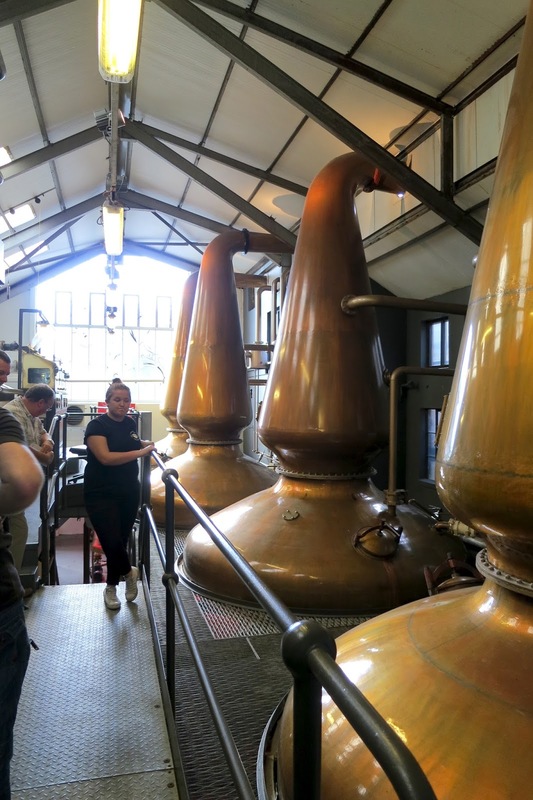 It's a fairly labor-intensive process, though 'Laddie appears to be a bit up the scale compared to Springbank and Kilchoman. The tour ended back in the visitor center, where we were offered samples of a few different whiskies. I tried a bit of the Laddie 10, to see how it compared to my bottle. It had the same acrid peat reek, but I was also not in top form that day, so it wasn't definitive either. What really chaffed about being sick was that I had scheduled myself for a warehouse tasting after the tour. However, my stomach still wasn't feeling right, so I decided that it was better to be safe than sorry. I stumbled back out into the sunshine around a bit before noon and walked to the B&B. It was really frustrating to feel so miserable on such a glorious day. At this point I was faced with a dilemma. I had a tour at Kilchoman scheduled for 3 PM, which meant that there was theoretically more than enough time to pack up and ride there. However, I still wasn't feeling up to food at that point, so I'd have to push myself pretty hard just to get there. Complicating matters, I also needed to get to Ballygrant by the end of the day, as I was only staying in Bruichladdich for one night. So the question was whether I wanted to soldier on and see Kilchoman or play it safe and head straight for Ballygrant. Being the stubborn person that I am, I decided to go to Kilchman and hope for the best. So I packed up, settled my bill, and (slowly) set off down the road. It was only a few miles along Loch Indaal before I hung a left turn onto the B road heading west towards Kilchoman and Loch Gorm. While the road wasn't too bad and the traffic was surprisingly light, the terrain was rolling, which made it relatively hard going. Thankfully I only had a handful of miles to cover and the scenery was absolutely gorgeous. To complicate matters, the last stretch to get to Kilchoman is actually a rocky dirt road. I was actually able to ride it instead of having to walk, but it was a close-run thing. By the time I finally rolled up to the visitors center, I was at whatever stage comes after running on fumes - it was a wonder I didn't actually pass out. I had made fairly good time, so I actually had more than an hour wait before the tour started. Thankfully Kilchoman also has a decent cafe in their visitor center, which meant that I had time to refuel before the tour. My stomach had finally settled down enough that the prospect of food was finally attractive again. However, I had also reached the point where I was so tired that eating actually seemed like more effort than I could muster. I (very) slowly ate a sandwich and drank a Coke, which went a long way towards making me feel human again. Eventually the tour began and Rebecca led us to the malt barn. Kilchoman had already produced enough malt to keep them going for a while, so the space was being used as general storage when we were there. When they are processing barley, each batch is roughly one ton and they do two maltings a week. 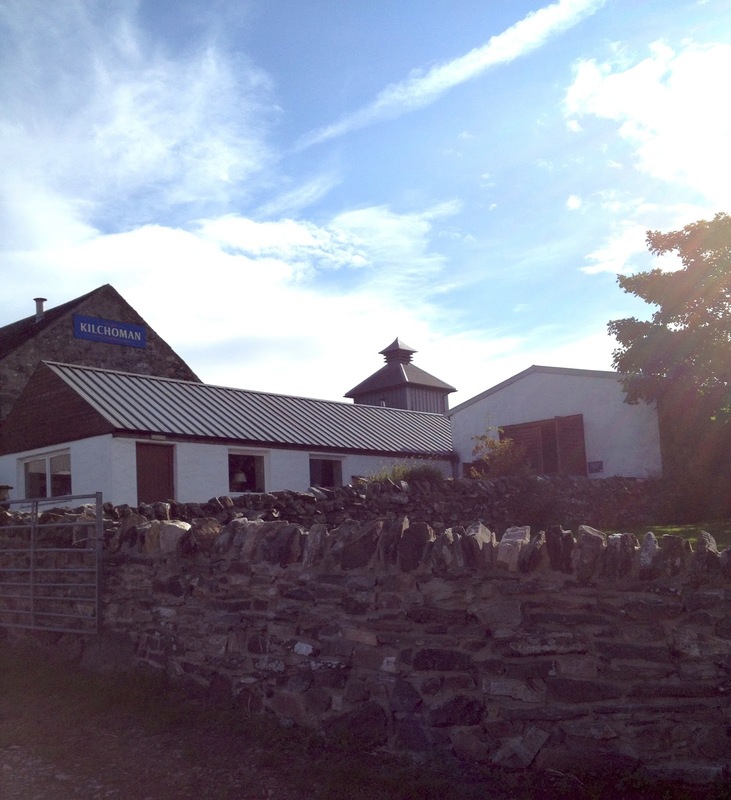 Kilchoman, like most of the distilleries on the island, sources most of its malted barley from Port Ellen. This barley is peated to a rather high 50 PPM. The other 30% is produced at the distillery from barley grown on their own farm. This is peated to a much more gentle 20-25 PPM. The local barley is kept separate from the PE malt, for use in their 100% Islay expressions. Rebecca also mentioned that Kilchoman is starting to experiment with unpeated malt, which I'll be quite interested to try if the whisky ever sees the light of day. 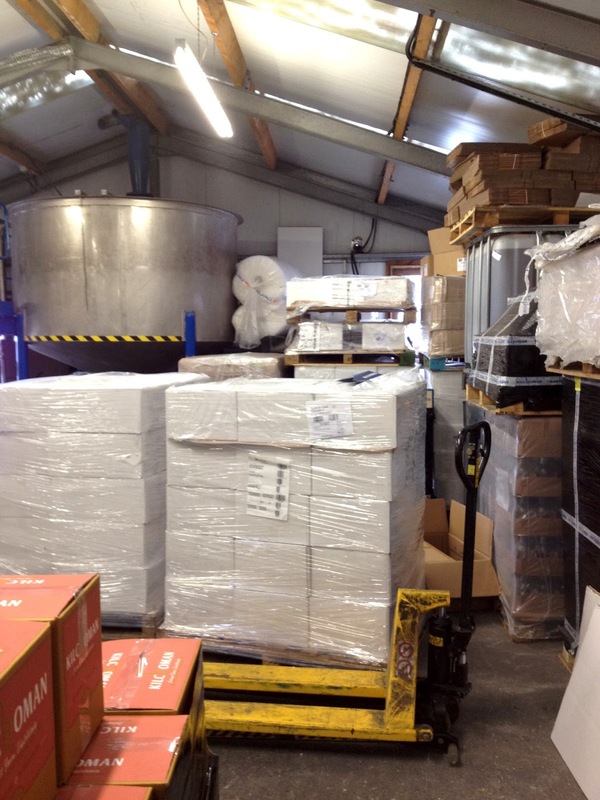 Because of the small quantities of malt Kilchoman produces at the distillery, that bucket in the lower left hand corner of the picture is enough to supply their kiln. From there we ducked inside the stillhouse, which contains all of the other equipment the distillery uses in their production process. This makes their process relatively efficient, since the liquids don't have far to move between mash tun, washbacks, and stills. Kilchoman uses stainless steel for their mash tun and washbacks. Each washback holds 3600 liters of wash, which is fermented for a fairly long 72 hours to reach a standard 8% ABV. 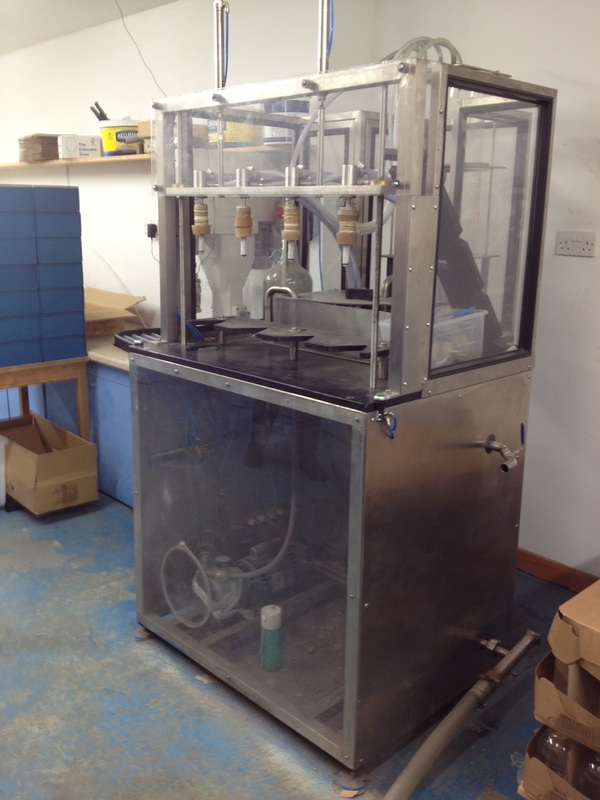 The output of each washback is split into two charges for the wash still. The wash still is easily the smallest on the island, with a capacity of just 3230 liters, giving a charge of 56%. It has a relatively plain shape, though the lyne arm does slope down at a fairly shallow angle. Given the small size of the still (smaller objects have a higher surface area to volume ratio) and the lower charge, the spirit gets a fair amount of copper contact during its first distillation, though this is slightly balanced by the lyne arm, which will reduce reflux. The low wines, which have an average strength of 25% ABV, are then piped over to the spirit still, which is even smaller at only 2070 liters. The bulb near the base of the neck of the still will increase reflux and copper contact, though this still also has a descending lyne arm, which will counterbalance that tendency. The foreshots cut is relatively short, ending only five minutes into the run. The hearts cut runs from a fairly high 75% down to a fairly low 63.5%, capturing a significant portion of the spirit. This makes sense, because Kilchoman simultaneously wants to produce a robust, smoky spirit, which requires a significant amount of heavier compounds to make it over, while also removing some of the less pleasant parts of the heads, which would require long aging to transform into more palatable compounds. Kilchoman currently has fairly low yield compared to the bigger distilleries (~400 liters/ton), getting 300 liters/ton from the Port Ellen malt and 260 liters/ton from their own malt. Given the lack of economy of scale at the distillery, it's not hard to see why their whisky ends up being fairly expensive. The distillery's goal is to expand production up from 120K liters of spirit per year to 140K by doing seven mashes per week. Hopefully this will give them the capacity both to keep up with demand and set aside more whisky for longer aging. When I visited, Kilchoman only had about 400 casks on site, with another 4000 tucked into various corners of bonded warehouses at other distilleries on Islay. 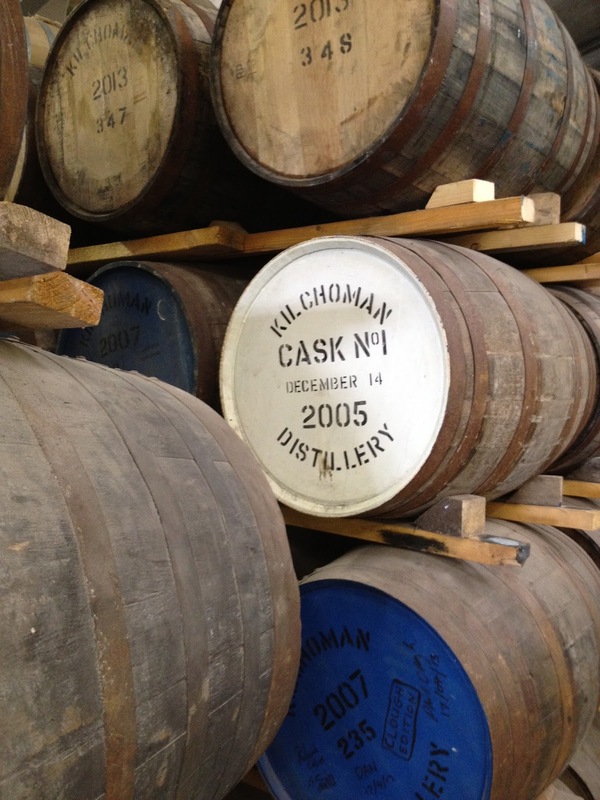 Kilchoman primarily uses ex-bourbon casks from Buffalo Trace, with a smaller number of ex-sherry casks. They're also experimenting with other wine casks, like port, madeira, and sauternes. I can't wait to see how some of those turn out. I just learned that a new warehouse was finished in October, which will give them space for another 10,000 casks on site, eliminating the need to store any of their whisky at other distilleries. 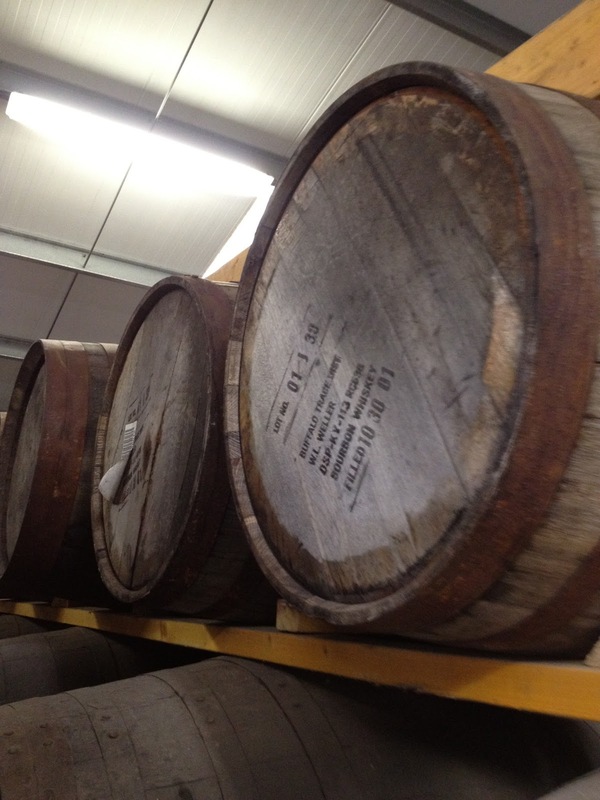 Both of their warehouses are the traditional dunnage type, with casks stacked three deep. While this makes for consistent aging, it does mean that it takes a lot of work to pull casks out. 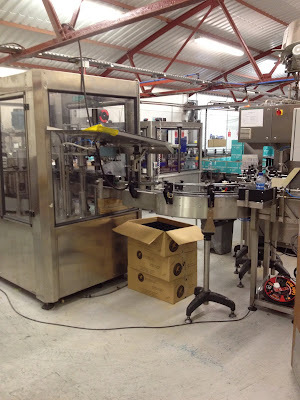 Kilchoman also does its own bottling on site, though it's a slow and labor-intensive process. 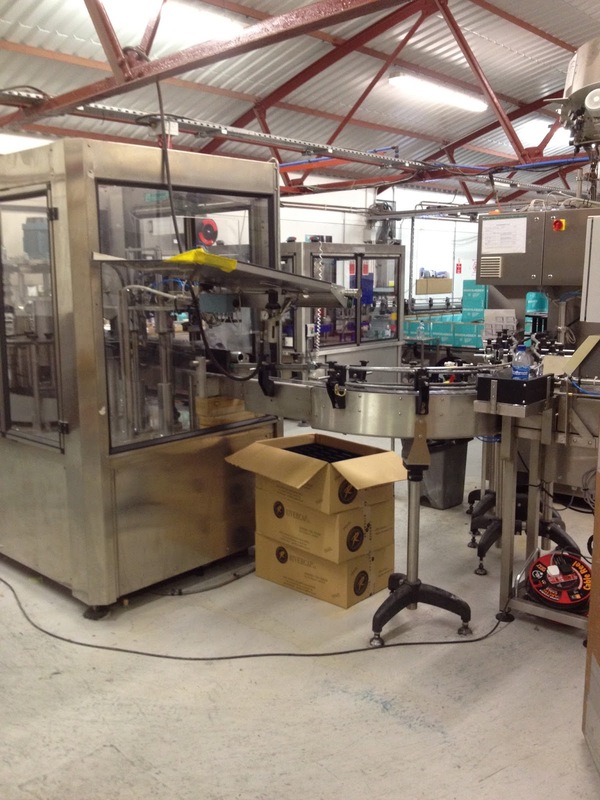 Automation will probably increase over time as their volume expands, but their goal is to keep it all on Islay to support the local economy. At the end of the tour, we all got a taste of the latest 100% Islay release. It was significantly different from the Machir Bay that I tried last year - because it is made from the floor maltings on site, the peat is significantly less aggressive, letting the malt shine a bit more. Additionally, the whisky is made from spirit aged entirely in ex-bourbon barrels, which means that it doesn't have the hint of sherry that Machir Bay picks up from a short finish in ex-sherry casks. I really wish I could have spent more time with the whisky and tasted it under better circumstances, but it certainly piqued my interest. Since my stomach had settled down a bit more, I decided to have a cup of hot chocolate at the distillery cafe before I left, as an extra boost for my ride to Ballygrant. It was, in a word, delicious, and I highly recommend having some if you ever visit. After collecting my things, I once again set off. The dirt road was just as tricky going as coming, but I managed to traverse it without incident. While the hills were rolling and somewhat tough going, the general trend was down, which helped. Eventually I rejoined the main road and continued towards the north end of Loch Indaal, where I would turn off towards Ballygrant. The ride proceeded largely without incident - traffic was a bit heavier than I had been dealing with earlier, but people were still more or less polite. However, I was definitely starting to run low on fuel again by the time I actually rolled through the town of Ballygrant. Unfortunately, my destination was further on. It was a little frustrating not knowing how much further I had to go, but there wasn't any option other than to keep moving. I am very grateful that I decided to find the Ballygrant Inn on Google Street View before I left - the signage isn't the easiest to spot, so it was very helpful to have seen a picture of the general area beforehand. I did get faked out a few times, but eventually found the right place with a decent amount of time to spare before sunset. There was another dirt road, but this time I chose to get off and walk. Check in was a snap and my room was just off the lobby. The place was currently being remodeled and my room had clearly been refreshed recently. Unlike the B&Bs where I had been staying during the rest of my trip, it felt much more like a traditional hotel. While not as beat as I had been when I got to Kilchoman, I didn't have a lot left in me and basically collapsed right after taking a shower. I had another long day ahead and hoped that I would feel better in the morning.